Postcard of Papawai Camp in 1916. 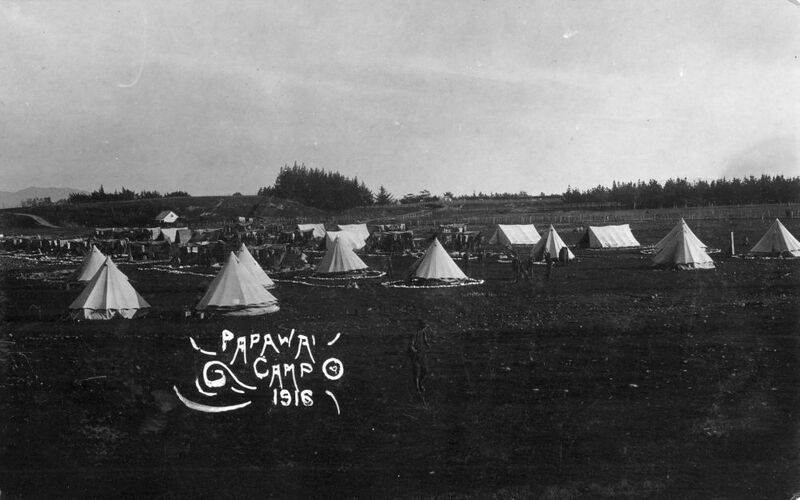 Papawai Camp was used by the Mounted Rifles, groups of which would be in residence for about a week. Small groups of specialist troops (engineers etc.) also used the camp. Infantry marched from Tauherenikau, and later Featherston, for a day’s shooting at Papawai, a round trip of about 20 km. By 1917 there were some permanent buildings – headquarters, dining hall, small hospital, post office and a YMCA. The accommodation remained under canvas. After the war the camp disappeared quickly while the rifle range continued to be used by rifle clubs.